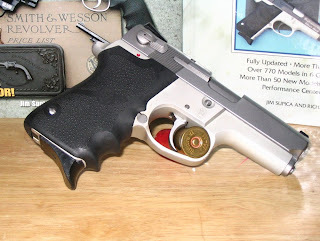 I’m a big fan of Smith & Wesson hand guns, especially those that are slightly older. In fact everything I own is a S&W product, except my Walther P22. Since Smith owns Walther now, it’s part of the family. The Teutonic cousin, if you will. For semi automatics, I really like the third generation pistols. I’ve had Glocks and Sigs, but the Smith’s just feel right in my hand. The most recent addition to the collection is an almost never used Model 6906. I’ve wanted one for several years and everything came together a few weeks ago so I picked it up. The only thing I’ve changed is the grips, putting on a set of Hogue Monogrips. They fit my hands very nicely and make the firearm comfortable to shoot. I finally got to fire it the other day and like most of my firearms, it’s more accurate that I am. Still, I was pleased with my efforts and this will become one of my regular carry weapons. I have two other third generation 9mm pistols and since they are almost identical in function, I can carry any of them without having to remember where the controls are. If you’re really good and continue to read my blog, I’ll post more pictures in future posts. I don’t understand how you can be a nurse and carry guns. That would not happen in my country. Your mind, it needs to be right. I’m not sure what carrying a gun has to do with being a nurse? Sure, when he’s at work his job is to help the sick and injured. But when he’s on his own time, if he feels like carrying…why not? I’m sure he’s not out waving it around letting everyone know he has it on him. I’m a paramedic and I carry. When I do though, you’d never know I had it on me. And quite honestly, if it came down to me or someone else…well, I’m looking out for number one first. It’s a last resort, but it’s there should it ever be needed.Good on ‘ya for exercising your right to carry. Just because someone carries a gun doesn’t make them a criminal, or heartless or a poor nurse. Congrats on your new piece. Hopefully it serves you well. There in lies your confusion Mr. Pamola. I’m not a nurse, I’m a paramedic. If you want to visit the blog of a nurse that carries a gun, several in fact, please click on the link for Xavier Thoughts. I should clarify, however, that I don’t carry when I’m at work. We have a rule against that. I’m still working on righting my mind, though. I am sorry for my confusion. Thank you but I will not visit your friend’s blog. Some nurses scare me, and they should not carry guns. Good for you for getting your mind right! You will make a good nurse. That is a fine weapon. I carry a Sig (not at work for there are rules. )It’s a large frame but I have a big enough booty to manage it. LOL. Love your blog man. Going to add you to my list. I advise caution Mr. Ambulance Driver. These are dangerous things. But I am sure that you are also a good nurse too. 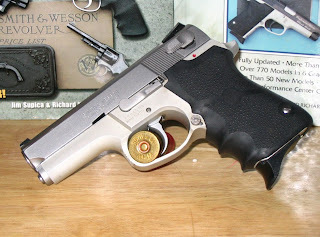 AD, I had a G23, but sold it because I just like the S&W products better. At some point when I can, I’ll probably pick up a 3rd gen .40 just for completeness sake. Mr.Pamola: Freud once said that “The irrational fear of weapons is a sign of retarded emotional and sexual maturity.”TOTWTYTR: I dig the guns, man, very nice!